I had been immersed in labyrinth research for months. I was searching for a six or seven-circuit labyrinth to replace the fading labyrinth at the Angela Center in Santa Rosa, California. Looking through my reference books, I suddenly realized that labyrinths of the past two thousand years were first laid out on paper by using a compass. I became aware of a small dot in the center of the twelve concentric rings that made a pre-Chartres labyrinth. Because I had recently been taught by, Richard Feather Anderson, how to make "Flower of the Heart Mandalas" with a compass, I suddenly realized that whomever had drawn this labyrinth had used a compass to make the concentric circles(1). I wondered if I could make a labyrinth in this way? I immediately felt a creative upwelling that was so strong I could not ignore it. Bringing out my compass, black-papered note pad, and white pencil, I began to draw eight concentric rings for a seven-path labyrinth. I was amazed to find its shape emerging from the paper. I experienced getting out of the way, allowing the design to come through my hands, pencil and paper. It was the most visceral experience I have ever had of my masculine, thinking mind, working equally with my creative, non-verbal feminine. Quickly, all was complete except for a small portion of rings in the lower left/central area. Instead of forcing the design, I let it be for the rest of the day. Later, as I sat in my living room in front of the evening fire with family and friends, I again felt the urge to finish the labyrinth. Picking up the paper and pencils, I went back to that particular area where I had earlier stopped. Everyone and everything in the room faded into the background. With a few erasures and repositioning of the turns, my labyrinth was complete. I wrote to Jeff Saward of Labyrinthos, Labyrinth Historian and editor of Caerdroia, the Journal of Mazes and Labyrinths, to inquire if he had ever seen this particular design. He graciously wrote back to inform me that it was not a design he had encountered before. Although he did say there were elements of the Santa Rosa design that could be found in older designs, such as the six-circuit 11th century Siweard's labyrinth, mine was unique. The making of this labyrinth blossomed into many other experiences, which continue to this day. Its name, the Santa Rosa Labyrinth came to me the first time that I placed it on the ground with my friend and colleague Marilyn Larson. The original design did not have the small open space, which is found on the fourth path. Some time in June of 1997, I wondered what would happen if I lined up the entrance path with the path into the goal. Laying the design out on my front lawn, I noticed the space emerge on the fourth path, the heart path. I was curious about its significance, if any. Close to a year later, while joining with other colleagues to paint the first Santa Rosa Labyrinth on canvas, all of us once again, noticed the empty space on the fourth path. What if we placed a bowl of fruit there, or a candle? We recognized that this area allows for a focus of the heart, experienced and viewed from all four directions. This space has come to be known as the heart-space. Thank you for birthing the SRL design. I love looking at her, walking her, and making her for others. I feel (I get excited here) that all who walk her come to love her too. Here are a few Santa Rosa Labyrinths that have been built throughout the United States and around the world. From left to right: The Santa Rosa Labyrinth on the Green Roof of the American Psychological Association, Washington, DC; The Santa Rosa Labyrinth on a bluff in Australia; The Santa Rosa Labyrinth at Standing Bear Park, Ponca City, Oklahoma, installation by Marty & Debi Kermeen of Labyrinths In Stone; Santa Rosa Labyrinth in South Africa. 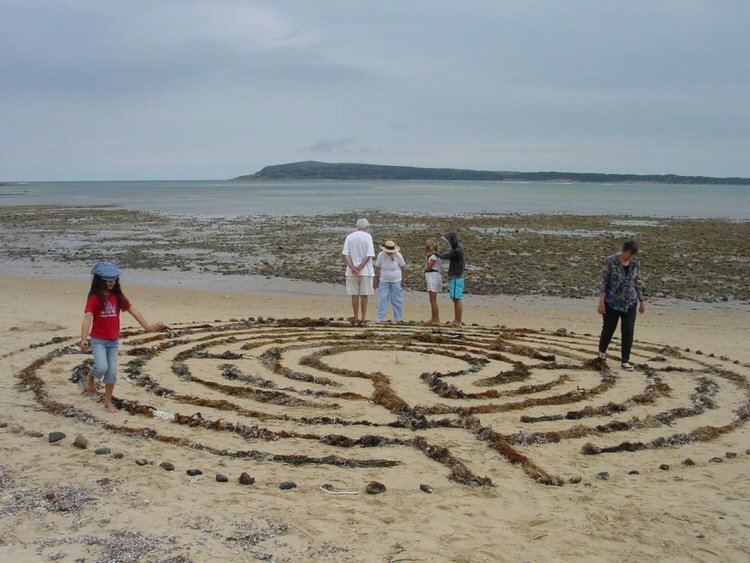 Over the years there have been many others who have brought their creativity to the Santa Rosa Labyrinth. I am forever grateful to my friend and mentor, Richard Feather Anderson (who taught me how to make Flower of the Heart mandalas with the compass at the 1996 Labyrinth Conference at the Omega Center in New York), Marilyn Larson, Sue Anne Foster, Kimberly Lowelle Saward, and Alyssa Hall, who came together with me to paint the first Santa Rosa canvas labyrinth. To Laura Lopez for all our labyrinth journeys together with Kimberly. Special thanks to Robert Ferré and his late assistant, Judy Hopen, for helping to bring the Santa Rosa Labyrinth into the world in a larger way through their beautiful work. To Marty and Debi Kermeen with their art of stone installations, iSpiritual with their finger labyrinths, and the many other individuals and organizations, both private and public, who have brought beauty into the world through their inspired work with the Santa Rosa design. The Santa Rosa Labyrinth has now been installed throughout the United States, Canada, Mexico, South America, South Africa, Australia, and travels through Wales on canvas. 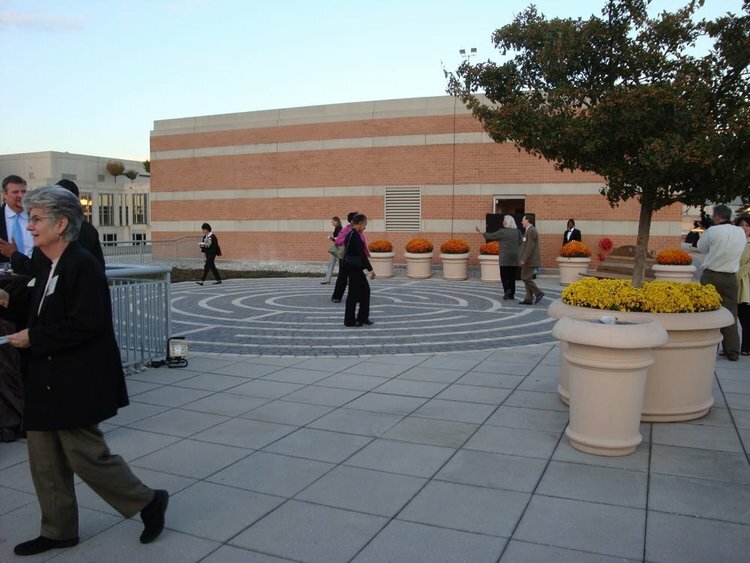 Major installations with the Santa Rosa design include a reclaimed hazardous waste site at Standing Bear Native American Park, in Ponca City, OK (Installation by Marty & Debi Kermeen of Labyrinths In Stone), Minitab Statistical Software Company in State College, PA, and the American Psychological Association eco-friendly green roof top garden in Washington, DC. The Santa Rosa design was the first of a wave of neo-medieval designs, created since the mid-nineteen-nineties in the United States by diverse labyrinthers for different needs and styles. These contemporary designs meld together the seven-circuits of the classical labyrinth with the quarter and half turns of medieval labyrinths. Each of these newer designs has a unique story of how they came to be. I am filled with gratitude as this labyrinth continues to grace my life with creativity, connections, and with beauty. It is my hope that this Creative Life Force will be an inspiration for others as they search for their own centers in the twists and turns of the Santa Rosa Labyrinth. (1) The idea of the Labyrinth: From Classical Antiquity through the Middle Ages, by Penelope Reed Doob, p. 49. We request that you register your installation with us for historical documentation. There are no user fees for persons desiring to make a single copy of the Santa Rosa Labyrinth under the cost of $15,000.00. We ask that the integrity of the design not be changed, that the name “Santa Rosa Labyrinth©” and my name, Lea Goode-Harris as the original designer be displayed (eg., any signage, brochures, publications, or internet display), and a website link be provided for Creative Labyrinths (www.creativelabyrinths.com). Public and Commercial Spaces and all other installations, please contact Creative Labyrinths, directly. If you want to use the Santa Rosa Labyrinth for commercial use, i.e. : to make finger-labyrinths, jewelry, wall hangings, art work, etc., there is a 10% user fee. It is required that the artist send me a prototype and sign a licensing and royalty use fee with Creative Labyrinths prior to initiating sales.